by Patricia Aufderheide and Peter Jaszi. Chicago: University of Chicago Press, 2011. 199 pp. Cloth $17.00. ISBN: 978-0-226-03228-3. The battle over intellectual property rights, and the copyright law that surrounds them, was once the purview of economists and lawyers. With the explosion of electronic mass media, however, the ability to use and reuse cultural artifacts for art, filmmaking, social commentary, and more has made intellectual property rights the focus of a growing number of sociologists, political scientists and other actors who seek to preserve the general public’s right to engage pop culture. RECLAIMING FAIR USE: HOW TO PUT BALANCE BACK IN COPYRIGHT by Patricia Aufderheide and Peter Jaszi is a balanced analysis of how copyright law has transformed over the past few decades and a practical guide on how to establish clear “fair use” codes that protect both the creator of cultural artifacts and those who wish to reinterpret them for an alternative audience and purpose. The primary argument of the text is that hyper enforcement of copyright law discourages creativity. It prevents people from re-using cultural artifacts to comment on and reinterpret the cultural landscape. Over the past few decades, Aufderheide and Jaszi argue, two camps have battled over copyright enforcement ‒ those who want a commercial interpretation of copyright law to protect their property and financial benefits, and those who are artists, teachers and movie makers who need access to culture to express themselves. The Introduction frames the book, “Copyright conversations have become like a battleground between two worldviews. One is that of mass-media corporations fighting for control of what they understand to be their enclosed garden, generation fruit to be sold by the harvested bushel . . . The other is that of people who make new cultural works ‒ often artists, remixers, appropriators, self-styled pirates who understand the cultural landscape ready for grazing and the creation of new, zesty products” (p.ix). Academic concern over hyper enforcement of copyright law is not new. As the authors note, concern about restrictive copyright law dates back decades. What makes this book unique is that it takes up the academic debate over intellectual property rights, culture and changing technology, but then goes a step further and offers a clear and realistic solution to the problem. Simply put, this book is on a mission. Aufderheide and Jaszi want everyone to understand that fair use is a powerful tool that allows people to appropriately use cultural artifacts (songs, movies, art, tv, pop culture) to engage in all types of work. They not only want to promote understanding, but in a unique approach, provide step-by-step procedures on how to carry out their fair use revolution. [*638] They want a more flexible copyright environment and believe that creating “codes of best practices” in an industry- by-industry approach that focuses on fair use rights will best facilitate that environment. As a professor at a university that once banned the College Democrats from showing a tape of President Obama’s inauguration (four hours after it was live) without getting written permission from CNN and ABC News, I feel they have embarked on a worthy endeavor. Earlier works such as THE CULTURAL LIFE OF INTELLECTUAL PROPERTIES by Rosemary Commbe (1998) did an excellent job setting the table for this debate. Aufderheide and Jaszi bring the lofty academic debate down to a practical level. The book is organized into 10 short chapters, running a total of 154 pages, with a series of useful appendices at the end. Chapter one highlights the fear and doubt that surrounds copyright law. The authors note that most people approach copyright law from ignorance and therefore are risk averse. They don’t know what they are allowed to use and do, but they know that they will get sued if they do it wrong. In that environment, it is safer to do nothing. The problem they note, is that we have become “a nation of makers and sharers” (p.7) using YouTube, Facebook and blogs to co-opt existing cultural works and transform them into other purposes. In Chapter two, Aufderheide and Jaszi revisit the danger of overzealous protection of copyright. They argue, “if you do not limit the control that copyright owners have over their work, owners become chiefs of private fiefdoms of culture and private censors of future culture” (p.16). The solution they contend is to reinvigorate the “Fair Use” doctrine. They hypothesize that a well crafted fair use code protects creators but avoids the legal anarchy of anything goes ‒ it protects the creator but empowers the collective and collaborative process in society that uses pre-existing artifacts. Chapters three and four take a historical approach to the evolution of fair use doctrine. The chapters examine the impact of legal changes in the 1970s which empowered corporations and then explain how a coalition of academics and artists started to turn the tide towards a more permissive copyright environment. The rise of publishing, filmmaking, and mass media as a business, they argue, brought corporate interests into the mix. There was so much money to be made on these new endeavors that Congress eventually passed the 1976 Copyright Act. Based on the law and economics movement of the time, this law saw copyright law as an economic vehicle, not a cultural vehicle. This movement was bolstered by the fears that intellectual property rights would be violated in the arena of free trade. Most American interests were in defending the creator against those who would “steal” it abroad. Chapter four looks at how academics using books, conferences, and institutes challenged the prevailing attitudes towards copyright law. Chapter four reads much like a literature review identifying the early crusaders in the movement to liberalize copyright law. Chapter five continues that theme but shifts its focus towards legal challenges to copyright precedents. Although he is [*639] not mentioned by name, Chapter five will remind many readers of the legal mobilization work of Charles Epp. The authors look at how institutions of resource mobilization picked specific legal fights to change the direction of how courts interpreted copyright law. Chapter six discusses how the courts are starting to “get it”. Through a series of strategic legal fights, the courts are starting to focus on more than just the economic interests of the creator prong of copyright law. They are now beginning to give greater weight to “transformativness” (p.81) ‒ does the use of a pre-existing work create a new purpose to a new audience? Chapter seven is a fascinating case study of how documentarians confronted the dilemmas of copyright law and fair use doctrine to create their own industry code. Aufderheide and Jazsi wanted to show how an industry or a community of interest could come together and create a code of best practices that would create the necessary balance between the rights of individual creators and those who wanted to re-use those creations. Documentaries serve as an effective example since most use pre-existing work to make their point. Chapter eight continues this theme with another case study focusing on media literacy teachers. The authors understand that transforming copyright law with the fair use doctrine requires more than just legal precedents. They argue there must be a systemic change in the way we all understand copyright law. For that to happen, people must engage and be informed. The problem with documentarians, they note, is that the community is too small to affect significant change. With only a few hundred documentarians in the world, they needed a bigger audience for that transformation to take place. With a series of grants, Aufderheide and Lazsi replicated the process for media literacy teachers whom they hope will educate students across the country. 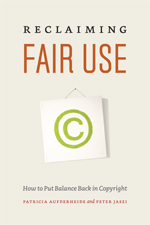 There is much to like about RECLAIMING FAIR USE. This book is clearly focused on an important problem and offers a cogent solution. It provides overwhelming evidence, arguments and tools showing the problem can be solved. It is refreshing to see academics provide a clear path to a solution than simply pontificate about lofty intellectual issues and then leave the reader with no solutions. This book does not get caught up in over legalizing the issue, nor fall into the trap that some social scientists get into by losing the reader in discipline specific vocabulary, abstract theory, and over intellectualization. The reader finishes this book having no doubt that the authors have found a good solution to the problem they introduced and even provides tools on how to get there. It gives you the problem, the history, the competing world views and then offers a clear path to compromise the benefits all parties. The use of hypotheticals, case studies, to “test” your knowledge as you go along are also fun and effective. If you are a teacher of media literacy or communications law, this book provides fun “what would you do in this situation?” projects. If there is any weakness to this text it might be that it relies on a silver bullet theory that crafting mutually agreed upon fair use codes will solve most copyright battles. Because they offer a singular solution the book feels mildly [*640] repetitive at times. This criticism is minor and in no way should prevent anyone interested in copyright law, cultural studies, or mass media from reading this book. Commbe, Rosemary J. 1998. THE CULTURAL LIFE OF INTELLECTUAL PROPERTIES: AUTHORSHIP, APPROPRIATION, AND THE LAW.Duke University Press. Copyright 2013 by the Author, Mathew Manweller.